GoSquared uses tracking cookies to keep track of new and returning visitors on your site. 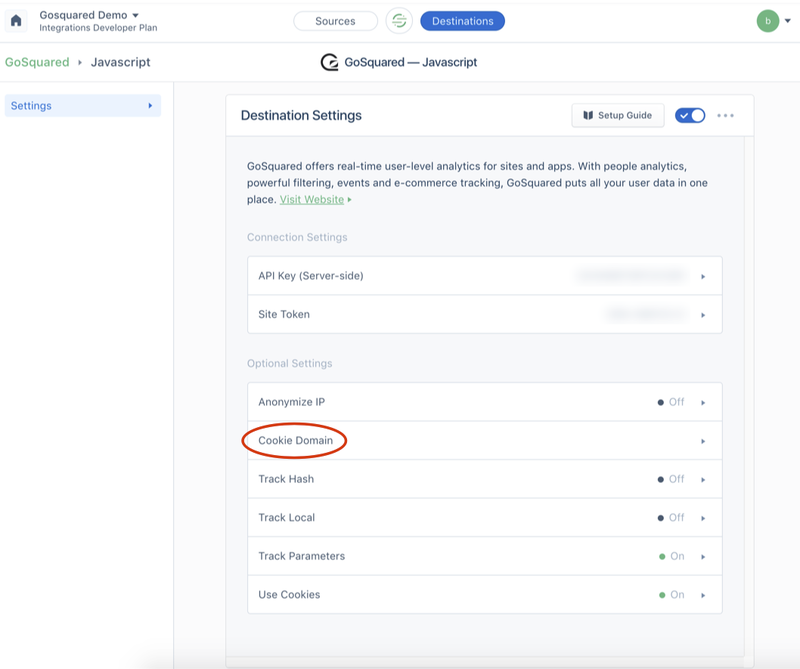 By default, GoSquared will set a new tracking cookie on each subdomain that a visitor visits – even if you have installed the same tracking code on all of them. If you want to change this behaviour so that GoSquared uses the same tracking cookie across all of your subdomains, you'll need to add an extra line of code that forces GoSquared to do this – see guide below. Why use the same tracking cookie across subdomains? So, if you want to avoid duplicate profiles in People CRM, maintain live chat history when a visitor moves across subdomains, and also correctly report new vs returning visitor numbers, it's a good idea to read this guide! In order to avoid duplicate user profiles being created, and to correctly maintain live chat histories, you can force GoSquared to use the same tracking cookie across all your subdomains. To do this you'll need to use the cookieDomain configuration option in your GoSquared tracking code. After the main tracking code snippet add this extra line, replace the 'my-main-domain.com' part with your site's root domain. Note: you'll need to add this extra line to every subdomain you want to track and also your main root domain. You can read more about technical config options in our API documentation here. You can set the cookie domain in Segment by logging into your Segment account and selecting GoSquared from your list of active destinations. Click through to the GoSquared settings and select the cookieDomain option. You can add the same tracking code to as many subdomains as you like and their Analytics will all be tracked together in the same project. This can be useful for creating a 'total traffic' overview dashboard. However your new vs returning visitors numbers may be inaccurate unless you use the cookieDomain code option explained above. Alternatively, you can create a new project for each subdomain and track them separately with a different tracking code on each subdomain. This can be useful if your subdomains are relatively independent from each other. If you want to separate your traffic between subdomains then we would recommend using one tracking code on all your subdomains to create a global traffic dashboard, and then add a second tracking code to each subdomain. This would create a new separate dashboard for each subdomain. Our tracker documentation on multiple tracking codes explains how to implement this feature.